Left: Dual purpose scale capable of weighing many animals at one time as well as trucks. Right: Animal livestock scale with cast lever system that resists corrosion. There is a wide variety of produce and livestock agricultural weighing applications. Crop production applications include use of scales for formulation of fertilizers, insecticides, herbicides, and hybrid seed production. Livestock applications include formulation of feed and check-weighing animals for rate of gain on different types of feed. In the packing plant, mono-rail scales are used for checking the yield (checking the carcass weight compared to the live weight), checking the shrinkage (loss of moisture weight in the cooler), and weighing the primal cuts of the final product. At the end of the cycle, scales are used in retail and wholesale buying and shipping of the final product. Scales may be used differently in produce and livestock settings. Produce scales tend towards seasonal use. During harvest and transportation periods, there may be heavy use, while the other 35 weeks of the year there may be more moderate usage — perhaps not more than 20-30 trucks per day. In addition, produce sales are located in a truck, so it is easier to control exactly where the load is placed. Livestock is typically priced much higher than crops. For example, meat is worth more than $1 per pound on the hoof, while corn is worth about 6 cents a pound. This results in smaller graduation sizes for scales – 5 pound graduations for livestock versus 20 pound graduations for grain. 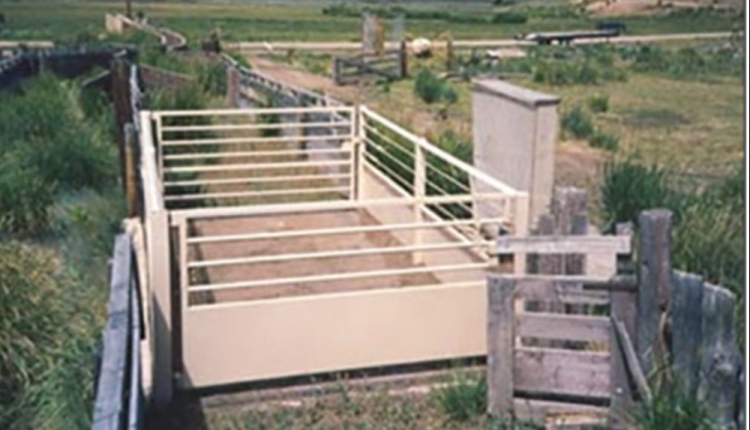 Since livestock is on the hoof, the load can be located anywhere on the platform, with more motion from the animals moving around. Weighing operations are increasingly becoming more involved in tracking products through the food chain. For crops, users will have to know if the product was genetically modified, treated with any herbicides or insecticides, and stored properly to prevent damage. Livestock applications will be involved in tracking the animal from birth to slaughter, and determining if the animal crossed any borders, or came from an area where disease was present. Another trend that will affect weighing applications is increasing use of higher resolutions than allowed by the National Type Evaluation Program (NTEP). Instead of the 10,000 divisions allowed by NTEP, users look for 20 up to 50,000 divisions. This is in response to advancements in technology requiring tighter inventory control of expensive ingredients added to inexpensive bulk commodities. The top things to look for in a scale for produce and livestock agriculture applications are accuracy, repeatability, sensitivity, reliability, and serviceability. Most users in this environment deal with a very small profit margin on huge quantities, so they require reliable, accurate weights without having to expend time and money on maintenance and upkeep. There are significant consequences if the right scale is not selected. If the weights generated by the scale are not reliable, they are useless. Aside from simple aggravation and inconvenience, if the scale is broken or condemned by the state, arrangements must be made to use another scale. It may lead to distrust, with users thinking they may be cheated by inaccurate weights. The inaccurate scale must be replaced by an accurate one, resulting in additional costs. Due to the cyclical nature of agricultural scale use, an inferior scale will almost always fail during heavy usage – just when it is needed the most. This often results in users repairing rather than replacing the scale due to time constraints. These emergency repairs are often more costly because of overtime labor and air freight rush for parts needed to get the scale back up and running as soon as possible. Often the failing scale is then replaced in the off-season — which means all the money spent getting the scale repaired is wasted. Many users think of scales as a commodity — no different than No. 2 field corn. This may result in purchasing the scale based on the cheapest quote. Such a scale is made as cheaply as possible without taking long term precautions to avoid deflection in the platform. The inexpensive scale will perform adequately when first placed in service, but the platform will weaken with every weighment, until it suffers from metal fatigue and has to be replaced. Another frequent mistake made when cost is the primary selection factor is choosing a pit scale built with very little rebar — such a scale will fail quickly because of low strength. One example that illustrates this issue is pit type truck scale sold by a Fairbanks competitor some years ago. 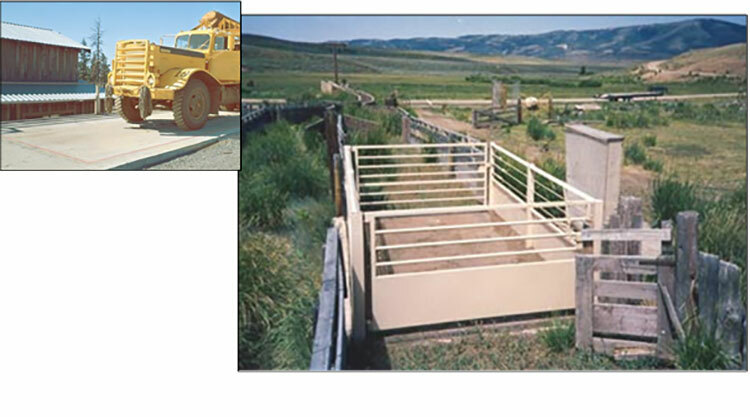 The fabricated steel lever system selected cost about $4500 less than a higher quality option. The steel lever system rusted away and frost caused multiple problems to the walls of the pit in which the scale was set. The customer had to pay to remove the scale, demolish the pit, and replace the scale — at cost of $115,000, far higher than the original cost difference. Scales play a major role in produce and livestock agricultural settings. Users should think of the scale as an investment in the business, not a cost of doing business. With the very real cost of repair labor, inflation, downtime, a wise customer should buy the very best scale made, regardless of price. In the long term, a small price difference is negligible.